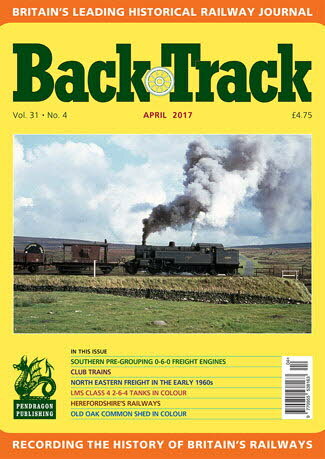 Railway Magazine | BackTrack April 2017 journal from Pendragon Publishing. Valediction to Old Oak Common - three pages of colour taken at the GWR's main London depot. North Eastern Region Freight in the early 1960s - Alan Taylor reviews developments on the smallest of the British Railways Regions. Whitmore: Part One - Mike G. Fell traces the history of a rural station on the West Coast Main Line in Staffordshire. The Closure of the Midland & Great Northern Joint Line: Part Two - Edward Gibbins concludes his investigations of this significant East Anglian closure. Take the Motor Car - some LNER publicity from the David V. Beeken Collection. Aldgate to Glyncorrwg - Eric Stuart explains how some Metropolitan carriages ended up in a South Wales valley. The LMS Class 4 2-6-4 Tanks - four pages of colour featuring the Fowler, Stanier and Fairburn versions of these excellent engines. Herefordshire's Railways - Stephen Roberts surveys the county's main lines and branches. Southern Pre-Grouping 0-6-0 Freight Engines - Jeremy Clarke describes the locomotive classes inherited by the Southern Railway from its constituents. On the Street where you Live - Neil Taylor's photographs of street names in South Wales derived from long-gone railways. A Good Run for your Money - Dr. Malcolm Timperley describes the life and times of the Club Trains. Curious Aspects of Passenger Behaviour - Alistair F. Nisbet looks into the 'travelling by train' experience.